Watch NCIS Season 10 Episode 10 online via TV Fanatic with over 7 options to watch the NCIS S10E10 full episode. Affiliates with free and paid streaming include Amazon, iTunes, Vudu, YouTube Purchase, Google Play, CBS All Access, and CBS All Access (Via Amazon Prime). 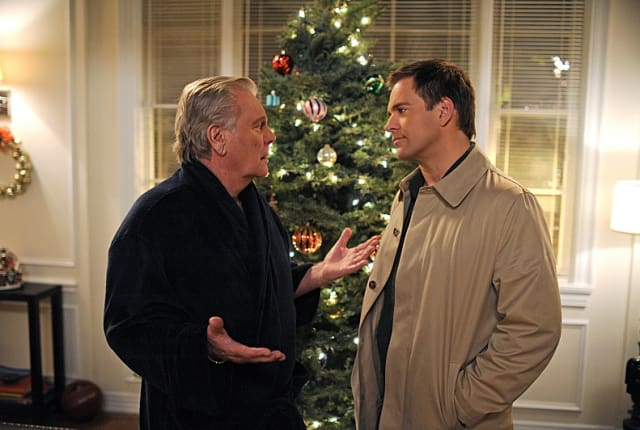 On NCIS, Tony must decide whether he's going to be naughty or nice when his father comes to visit for the holiday. Stewie: This was one crazy dude in college. Really knew how to have a good time. Tony: Shut up. No way. Stewie: Did he tell you he was the school mascot? Tony: No! What was the MIT mascot? McGee: Really. Does it matter? Tony: Oh yes it does. Stewie? Stewie: A beaver. He was Tim the Beaver our senior year. Tony: Please tell me you dressed up like a beaver. Tony Senior: What can I say? I'm me. I'm not gonna change. Tony: I know. I know you're not gonna change. And I don't know why I was smiling because there's nothing funny about this. Dad this is my home. I told you my rules, okay? And you broke them. It was a mistake having you here for Christmas. Tony Senior: You want me to leave. NCIS Round Table: "You Better Watch Out"
NCIS Sneak Peek: Look Who I Found!